I’ve lived in Magee nearly all my life. Zip burgers have always been considered the best burger to be had. I grew up on them, and they are wonderful. However, that’s a blog for another day. Hidden back behind the old elementary school in Magee, Mississippi is a gem of a burger joint. The exterior doesn’t look like much. It’s to-go only and is ran by a sweet lady who makes a mean burger. It’s so good she named the main item after herself. The Becky Burger is a big beautiful hunk of meat with cheese between buns to match with your usual burger toppings. My husband likes his with bacon. The meat has a terrific flavor and is hard to eat without making a mess. You’ll end up with juicy goodness running down your chin. I usually get tots with mine. 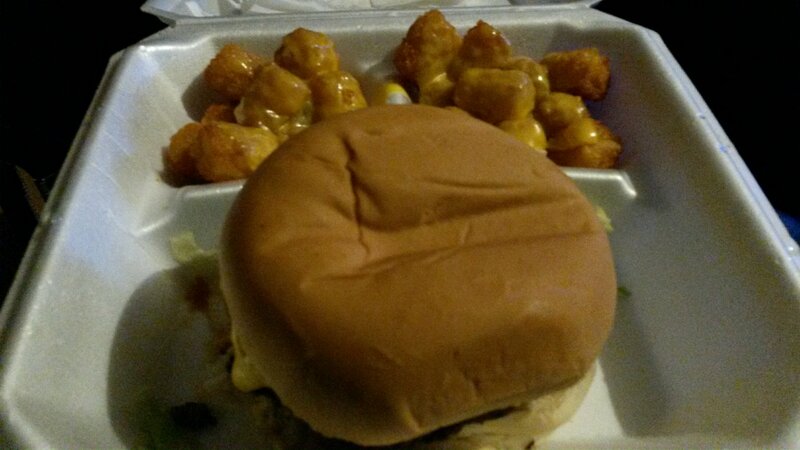 This time I got tots with cheese. The menu has something for everyone. The picture I have is not a very good one but shows the large variety they offer. How do they fit all that food in that little building? The world may never know, but boy am I thankful. They offer ribs on Friday which I’m told are wonderful. A member of my group got fried chicken. The breast was huge and was tender and tasty, and everything you want fried chicken to be. The pork chop was also mighty fine. Although I’ve never tried it, I’ve heard Ms. Becky makes a mean salad. We set out to get our Becky Burger order almost bouncing with anticipation. We arrived to find the parking lot full and customers like us who were ready to get their grub on. Having to park on the street was no big deal. I am a supporter of local businesses in our area. It makes my heart happy to see any small business busy and doing well. We made our way up the window to pick up our order. Greeting other customers, we chatted for a bit being early and our food not quite ready. Once back home, we divided up our grub and commenced to feast. Other than talking about how great everything was, we barely said a word. Even with our special requests, no tomatoes on this one, no lettuce on that one, and even gravy on fries, we got what we asked for and enjoyed every bite. With a belly full of goodness from our favorite hole in the wall, I recommend you seek it out and experience it for yourself.